← This one time, I had a blog. Things were a bit bumpy around here for me. The first post-separation batch of holidays. It was a trial navigating them. But I have survived, as I always will. I was a little down realizing, since my kids are so young and I’m manless, I wasn’t sure I’d have a gift to open. Which isn’t about the gifts I was just more sad about what I had lost and realizing I’d have to fill my own stocking. Lame pathetic thoughts like that. But my best friend came to my rescue, as good best friends do. She took my boys out and had them choose something for me. When she brought them back that night she said “Your boys know you well” and I was so proud. The kids were all secretive and “Don’t come in here Mom!” while they wrapped things. Putting them under the tree with a “It’s nothing special going on in here” and such. It was cute. So on Christmas morning I opened these great gifts. Wesley chose the tea mug. Which is an amazing pic for me. 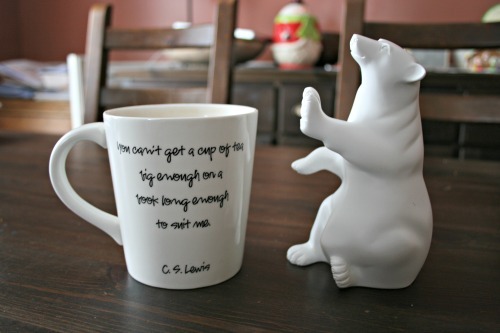 I drink tea constantly, love it out of big mugs and the quote nails it too. Nate chose the polar bear. I was a bit puzzled when I opened it and when I looked at him he was soooo incredibly excited and blurted out “Because you like bears Mom!!!! Right!!! !” He was bouncing up and down and everything. It was the sweetest thing ever. Bear has been the centrepiece at every meal since. I think it might be a bookend because I know they were shopping in the bookstore, but I’m not 100% sure. It’s definitely a super sweet gift and a story I’ll remember. This entry was posted in kid fun and tagged christmas, gifts, mug, polar bear, tea. Bookmark the permalink. 5 Responses to I hope you had a great Christmas. Glad they were still super excited about them Christmas morning. You are so lucky to have a thoughtful friend take on this role. My ex ‘helps’ our daughter pick out something to get me and this year it was a stuffed animal she liked for herself. I like the High Five Bear idea too. The bear’s been living on the kitchen table, he eats every meal with us. Nate is still so proud. Wesley said “I knew you like tea Mommy so I got the tea cup!” and Nate was all “And you like bears Mom! !” It’s soooo cute.